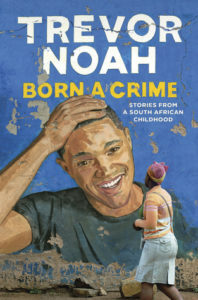 In this very engaging autobiography, Trevor Noah opens up about growing up in South Africa, born from a black Xhosa mother and a white Swiss father at a time when this was literally a crime punishable with several years in prison. The Apartheid regime ended while Noah was still young, but his childhood was still deeply affected by the fact that he was a mixed race child in a society where the races were not supposed to mix at all, to the point where his mother had to walk behind her own child and a mixed race woman when they were out in public, so no one would guess at their family relationships. Noah’s parents obviously were never married (as this was completely out of the question), but he has several stories of his mother’s eventual marriage to his alcoholic, violent stepfather, and the dramatic and truly astounding consequences this eventually had for his family. One of the impressions I came away with is just what a formidable lady Noah’s mother was (and probably still is), and what an unusual upbringing he had as a result of his mixed race parentage. As well as sharing a lot of childhood recollections that could have been merely depressing and sad if recounted in a different, less humorous light, Noah gives his reader/listener a lot of interesting facts about the colonisation of South Africa, the Apartheid period and huge changes the country went through once the racist system of segregation was dissolved. FYI: As of me writing this, the Kindle edition of the book appears to be on sale at Amazon. Share the post "A surprisingly educational celebrity autobiography"